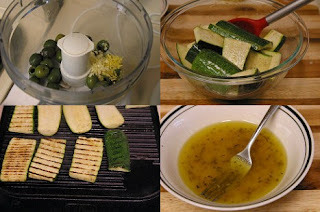 Grilled-Zucchini Sandwiches - Here in 'The Triangle' (Raleigh, Durham, Chapel Hill/Carrboro), we are blessed'to have some great restaurants. 'In the last couple of years, I have seen many articles referring to the local food/great restaurant movement going on here, and my only wish is that I had the money or stomach capacity to eat at every great restaurant and buy all the farmers market food I want. 'Since living here, I have really come to realize how good food tastes when it's made from fresh, seasonal ingredients. About two years ago, Neal's Deli opened in Carrboro, and everyone knew pretty quickly it was a big deal. 'I don't know very many people who love sandwiches more than I do, so I was even more excited. 'Luckily for my wallet, Neal's is just far away enough from my house to prevent me from eating there every day, but I'm happy to say that now I have at least one thing from their menu that I can easily replicate at home. 'Many thanks to Food and Wine Magazine this month for doing such a great write up on one of my favorite places to eat, and providing the recipe to one of my favorite sandwiches. 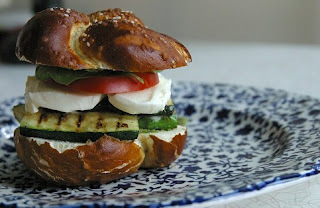 'Also, I should state that I couldn't really do this sandwich justice without being able to buy brezel rolls at Guglhuph Bakery, (another favorite place to eat) and well, neither could Neal's, since that is where they get theirs, too. 'I really do love this town. Before the recipe, I feel the need to discuss the brezel roll. 'First of all, Neal's uses them for their zucchini subs and other subs on their menu (including house made hot dogs! ), so I wanted to also. The magazine article just calls for hero rolls, which I admit are probably easier to get than brezel rolls. 'Also, let it be known that I got to the bakery a bit late, and therefore all they had left were brezel twists, and not the regular, slightly-bigger-than-hot-dog-bun rolls. 'Think of a really soft pretzel that has a slightly breadier texture, and you've got it. 'If you can't find these in your town, and'you would really like to give yourself a challenge in order to be authentic (to Neal's, not to the magazine recipe), you can always make them yourself. 1. 'In a food processor, pulse the olives with the garlic and lemon zest until the olives are finely chopped. (If you don't have a food processor, just chop the olives up as finely as you can, put in a bowl, then add the minced garlic, lemon zest, and oil, and stir together.) 'Add 1/4 cup of the olive oil and season with salt and pepper. 'Spread the olivada on the cut sides of the rolls. 2. In a small bowl, whisk the vinegar with the oregano, and 1/2 cup of the olive oil. 'Season the dressing with salt and pepper. 3. 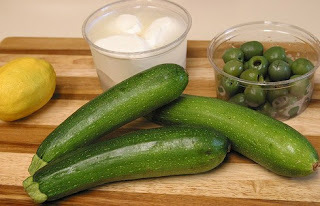 Preheat a grill pan on medium-high heat.. 'In a large bowl, toss the zucchini with the remaining 1/4 cup of olive oil and season with salt and pepper. 'Turn heat up to high, and grill the zucchini slices for about 5 minutes, turning once, until tender and lightly charred. 4. Mound the zucchini onto the rolls and drizzle with a little of the dressing. top with teh mozzarella, tomatoes, and basil and drizzle with more of the dressing. 'Close the subs, and serve immediately. 5. Try not to eat too fast.